EMC’s acquisition of Pivotal Labs proves the company really understands the big data market. Namely, that big data won’t go anywhere without great applications, and EMC isn’t the company to help customers figure out how to build theirs. At an event at the Pivotal office in New York today, EMC Greenplum SVP of Products (and Greenplum co-founder) Scott Yara let the world in on a dirty little secret: systems software company can’t build apps that users want to use. 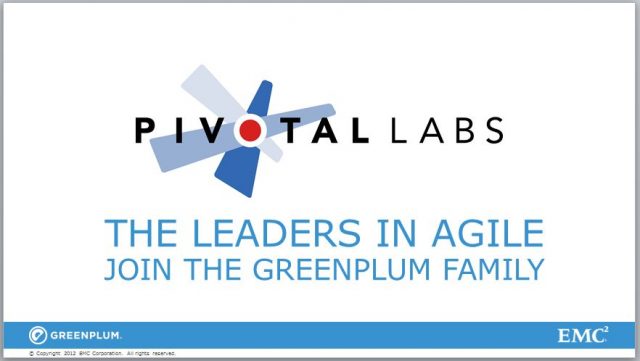 That’s why Greenplum actually contracted Pivotal to help it build the Greenplum Chorus product on which the company is placing a great deal of emphasis. Greenplum was so impressed with Pivotal, it decided the company needed to join the growing EMC empire, Pivotal Founder and CEO Rob Mee told me. See more now. Join us for a behind-the-scenes account of the most sophisticated political campaign of all time. This renowned tech pioneer and digital wizard will talk to the vast digital data operation that spanned cutting edge data science, social media and crowdsourcing—and share his view on what’s next in our world. The emergence of Apache Hadoop over the past few years has required organizations to completely rethink architectures that have been in place for decades. And with changes in the underlying data fabric, come ripple effects, and often bottlenecks, that impact all levels of an organization both business and technical. Discover what is possible for radical Hadoop performance improvements – an important capability allowing organizations to use data to discover and drive new top-line opportunities. Hadoop is the engine powering the Big Data era, an unstoppable force boasting massive investments and a rich ecosystem. But this is only the beginning: Hadoop has the potential to reach beyond Big Data and become the Foundation for Change, catalyzing new levels of business productivity and transformation. Hadoop will become the Foundation for Change. Join us for a breakthrough announcement. On February 25th, EMC Greenplum will unveil product and technology innovations that will make Hadoop bigger, better, more accessible and meaningful than ever before. We believe that Hadoop has the potential to reach beyond Big Data to catalyze new levels of business productivity and transformation. Join us as we reveal how Hadoop becomes the Foundation for Change. SAS and EMC Greenplum have joined forces to drive innovations that deliver Big Data agility to end-users. SAS High Performance Analytics for Greenplum accelerates the performance and capacity of SAS – enabling organizations to embrace Big Data in their analytical applications, while accelerating the pace of model development, testing, and execution. Join us to hear how EMC uses a data-driven, customer-centric approach to improve products, services, and processes – a strategy that enhances Total Customer Experience and creates business advantage. EMC Greenplum and Alpine Data Labs have created an integrated analytics solution that transforms what has long been a cumbersome and time-consuming process, performed by a team of specialists, into a simple and powerful system that delivers Big Data results faster than ever before and empowers cross-functional teams to work collaboratively in delivering business success. Learn about the industry’s latest data tools and techniques to support your organization’s quest for data-driven success. Organizations are under pressure to increase the speed and effectiveness of their decision-making to increase business agility. Increasingly, expanded analytic capabilities are the means to achieve this goal and that requires more than just a Big Data analytics platform. Organizations need to update the skills of their teams, foster an environment that enables analytic productivity, and develop a mindset towards data that values it as the new fuel for organizational productivity. Learn why human skills such as creativity, communications and leadership are becoming more valuable than ever in the era of big data. EMC announced the availability of Greenplum Chorus, delivering a Facebook-like social collaboration tool for Data Science teams to iterate on the development of datasets and ensure that useful insights are delivered to the business quickly. In addition to being social, Greenplum Chorus is now also open source. See a live demo of Greenplum Chorus, the industry’s first social toolset for Big Data, enabling Data Science teams to collaborate on datasets in a Facebook-like way. In this one hour webinar, you’ll hear about the latest trends relating to Big Data Analytics and Hadoop and how innovative enterprises are leveraging their Big Data assets to gain new insights and identify new opportunities to help them accelerate their business. You’ll also learn about six key challenges of providing an enterprise-ready Hadoop infrastructure and how to address them with the industry’s first and only scale-out storage solution with native Hadoop integration. Hosted by SiliconAngle and Wikibon, this pre-show discusses the next wave of Big Data. See how EMC's new products and services all have a singular goal - to enable organizations to derive greater insight and economic value from Big Data – datasets so large they break traditional IT infrastructures. Organizations across sectors are faced with a major challenge beyond the massive amount of data being generated. It’s unclear which technology mix provides the operational and business agility required for deriving maximum value from big data – so most organizations continue to work with limited point solutions or traditional BI tools. Learn why big data productivity requires an upgrade to a purpose-built, unified analytics platform and how bringing this capability into your organization gives you a decision advantage that will put you ahead of your competition. The growth of big data and the continuing dramatic decline in the cost of storage and computer processing power are having a profound impact on the way business is being conducted across sectors. This webinar focuses on the network as the fundamental technology that powers the compute and storage levels of the big data stack. You’ll learn why low-latency, nonstop networking is essential to keeping data flowing smoothly throughout your organization and enabling timely, precise analytics that enhance your business decisions. Gartner predicts that data will grow by 800% in five years, with 80% of it unstructured. The World Economic Forum recently declared big data as an asset class. We're only getting started to discover the implications of making better sense of large amounts of unstructured data to uncover business opportunities, strategies, and more. Is big data really an emerging market with lots of innovation, startups, job creation on the horizon? Why did it suddenly become possible? What are the obstacles, and the most promising areas of opportunity? How do you make it real in your organization? Join this group of thought leaders from Accel Partners, Factual, Greenplum, SAS, @Walmartlabs, and McKinsey Global Institute for a conversation that gets beyond the hype about big data. Join Greenplum and EMC for a live video webcast that will feature the unveiling of the industry's next-generation platform for Big Data Analytics. You'll see for yourself why Big Data is the answer to Agile. The era of Big Data is here. Leading organizations know that if they are going to tap into the business value of their Big Data, they must quickly evolve beyond business intelligence and put data analysis at the core of every business activity. Unfortunately, many companies take a fragmented approach to Big Data Analytics; patching together disparate solutions in an attempt to manage and analyze ever-growing volumes of structured and unstructured data. This approach typically drives up development costs, creates performance and reliability issues, and prevents organizations from leveraging the high-performance data analytics they need to become more predictive, forward-looking, and competitive. -Where to start your journey to Big Data. -How Big Data Analytics can help you achieve more growth, higher profits, lower costs, faster time-to-market, and greater overall business value. -Why Greenplum's customers and technology partners believe Big Data Analytics is driving the future of their organizations. -What's inside Greenplum's next-generation platform for Big Data Analytics- a platform that will be unveiled for the first time on the webcast. -How Big Data is becoming the new economic engine for business. Big data analytics is where advanced analytic techniques operate on big data. By now its obvious that big data that is useful for analytics is quite different from the pristine and well-ordered data of the average data warehouse. Armed with advanced analytics insights, business users can make well-informed, fact-based decisions to support their organizations tactical and strategic goals and create a competitive advantage. This is an important task right now, because the recent economic recession forced deep changes into most businesses. Going forward, organizations will need new tools and technologies to harness the power of big data analytics even if the organization has already deployed a full-blown business intelligence and data warehousing technology stack. We now live and work in a world where the sheer volume and velocity of information at our disposal requires a modern, highly scalable IT architecture to manage and make sense of it. In the era of Big Data, analytic tools and platforms need to satisfy a wide range of analysis applications, while being affordable and friendly to IT. EMC Greenplum delivers a family of Data Computing Appliance modules that allow you to easily deploy high-performance data analytics across your organization. The architecture combines best-in-class components and technology to minimize complexity and cost, while allowing for incremental expansion as needed to support the ever-increasing workloads of data driven enterprises. Massive volumes of information – commonly referred to as Big Data - are growing beyond the performance capacity of traditional data warehouses and database management systems. New technologies like analytic databases, open source software, noSQL and Hadoop are enabling businesses to process massive amounts of data that had previously been untapped and wasted. The bottom line is that BI has to evolve and give way to high performance analytics. Harness the skills of our big data tools and data science team to help global organizations realize the full promise of business agility and become data-driven, predictive enterprises.